Behentrimonium is a really popular conditioning agent. Tomorrow I will touch on how to use it but for today, the eternal question...........what is the difference between behentrimonium chloride and behentrimonium methosulfate? I decided to Americanise my spelling today (sulphate is English). The short answer to this question is not much. The long answer (not so long plus there are some diagrams!) is below! Q: Really not a difference between them? A: Behentrimonium is basically a surfactant (remember this post!) with a positively charged water loving head and a very long tail. Both chloride and methosulfate forms have the exact same surfactant. Q: So if they both have the same surfactant then why do they have different names? A:The difference between the two is simply in the ions (negatively charged molecules) that balance the charge. Behentrimonium chloride has a chloride ion which carries one negative charge and Behentrimonium methosulfate has a sulfate ion with two negative charges. See the diagrams below!! Q: What is 'balancing the charge'? A: Balancing the charge means for every positive charge there must be an equal negative charge so that they cancel out. 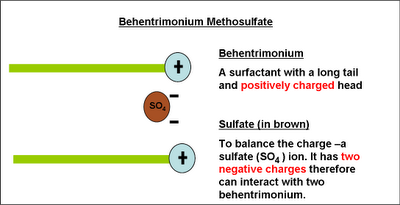 Q: So if the methosulfate form has two negative charges, is it not better since it will have two behentrimoniums with it? A: Not really. Technically the chloride and sulfate are present as 'accessories'. To be explicit, normally behentrimonium is effective at low concentrations - around 2 to 5%. The chemist will weigh out a quantity to make sure that the behentrimonium is present at this amount. Meaning more product if you are using the chloride form and less if using the methosulfate form. Q: So why do I like (insert chloride or methosulfate here)? A: You probably like the formulation of the conditioner. Okay that sounds really scientific lol. In plain terms you like the way that conditioner has been mixed. It is a bit like making a smoothie, I want extra mango in mine, someone else may want extra apple. 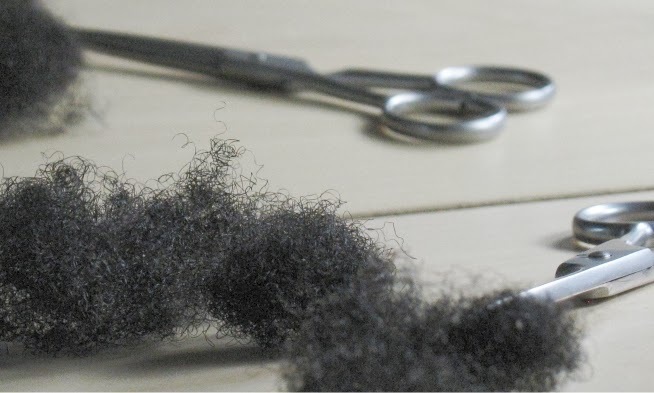 Depending on the condition of your hair (texture, dryness, softness etc) and the result you are looking for, you may find that one specific conditioner is really good. I have a pantene conditioner and a herbal essences conditioner, the first five ingredients are word for word, the same (same company makes them anyway!). However, the herbal essences takes it every time. My hair prefers that mix. Does this answer your methosulfate v chloride questions? If yes, let me know, If no, let me know! Tomorrow - How to use Behentrimonium! Is this ingredient good or bad for your hair & how toxic is it? I always find words like "chloride" (and acid) very very intimidating on an ingredient's list. I had a phase earlier this year when I was reading the ingredients lists and trying to avoid things with such key words. So if I understand this right, a chloride in a combination is not the same thing as the chloride in the swimming basin, where it is aggressive to my skin and hair? Like the "O" from H2O, water, can come in all sorts of combinations and be completely different substances? I understand what you are saying, it seems that scientists just haven't done a good enough job of explaining our work to people. For example if I said to you table salt, would you be intimidated? However if I said sodium chloride then depending on whether or not you have heard it before, it may be intimidating. I think I will have to do a more detailed post later on this subject. I don't know if I can answer your question well but I'll try. In short yes, chlorine in the swimming pool is very different in terms of behaviour from chlorine in behentrimonium. They are both however chlorine forms, it is just that the way they react is different. In the swimming pool, they form acids and help disinfect. In behentrimonium, they don't form acids, just help to balance charge. The closest analogy I can think of is for example an apple. You can eat it raw or you could cook it in an apple pie. They will taste different but both are still 'made' from apples. Thanks for your question, it has given me something to think about! Thank you, you already answered my question perfectly! Table salt, of course! I use good old NaCl solution for my contacts, for example.